OSAKA - Okinawa Prefecture’s campaign for the Feb. 24 referendum on the central government’s relocation plan for a U.S. air base kicked off Thursday, with the results and voter turnout rate likely to be key in indicating how Tokyo will deal with the outcome of the vote from a political standpoint. The referendum offers three choices, asking voters if they support, oppose, or neither support nor oppose moving U.S. Marine Corps Air Station Futenma from a densely populated area of Ginowan to a new facility under construction in the Henoko coastal district of Nago. But with the central government under no legal obligation to follow the results of the referendum and questions about whether the three choices might produce a muddled result, it’s unclear what impact the referendum will have on the long-delayed Henoko plan. Originally, those who pushed for a referendum wanted only the choices of “support” or “oppose” on the ballot. But after conservative mayors and city assemblies in five Okinawa cities and towns indicated last month they would not participate in a referendum with just those two choices, the “neither” option was added. The municipalities that initially refused to participate in the referendum included Okinawa, Uruma, Miyakojima, Ishigaki and Ginowan. 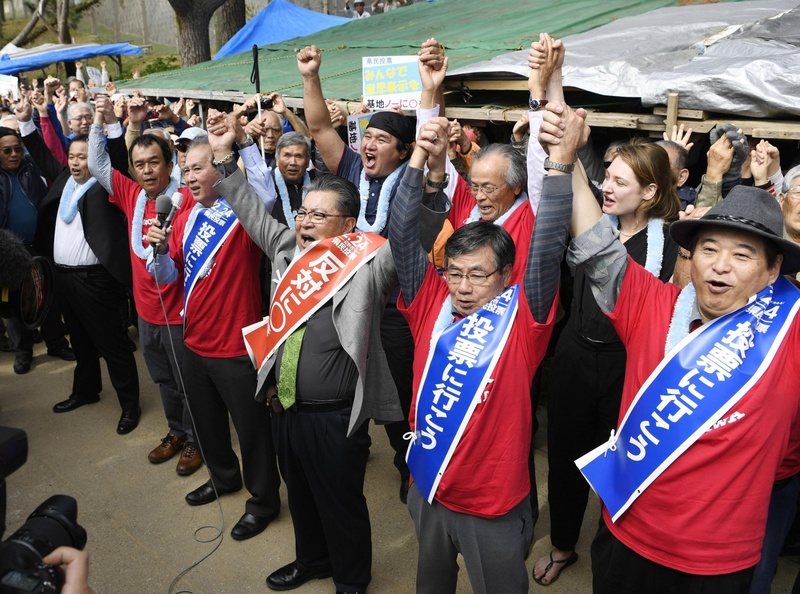 These municipal governments are closer than many others to either Prime Minister Shinzo Abe’s administration or the national chapters of the ruling parties, which support the Henoko project. All 41 municipalities in Okinawa Prefecture are now participating in the referendum. 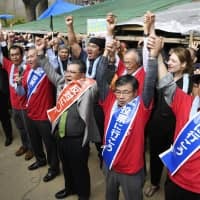 “Although there is the choice of neither supporting nor opposing the relocation, I think most voters who cast a vote in the referendum will be doing so in order to show whether they support or oppose the Henoko plan,” said Jinshiro Motoyama, who represents a civil group in Okinawa Prefecture that has pushed efforts to realize a referendum. In Tokyo on Thursday, Chief Cabinet Secretary Yoshihide Suga told reporters at a regular news briefing that the central government, which has long pushed for the Henoko relocation, would not comment on a local referendum. Land reclamation work for the facility, after being delayed for years due to local opposition, began in December. Suga, however, said that Futenma air station has been called the “world’s most dangerous airport” and stressed that it was critical that it be closed and the land returned to Japan as quickly as possible. He added that the government’s position on Henoko had not changed and that it was not thinking about halting construction between now and the Feb. 24 referendum. The voter turnout rate is crucial to how the results of the referendum will be perceived in Tokyo and Washington. Okinawa Gov. Denny Tamaki was elected last year on a platform opposing the Henoko plan and supporting the referendum. The election had a voter turnout rate of 63 percent. Under the law, a governor must “respect” the outcome of a referendum if it’s approved by at least a quarter of eligible voters. Whether the final referendum turnout rate is higher or lower than that, and whether the final percentage of voters who support or oppose Henoko’s relocation is more than half the total number of votes cast, could determine the post-referendum approach by Tokyo and Okinawa toward the Henoko plan. “At this point, we’re making all efforts to get everyone out to vote. The Feb. 24 referendum is a real test of local democracy, and something that has to be respected by the central government” said Osamu Toguchi, a prefectural assemblyman from the Japanese Communist Party who is a senior leader of a local group opposed to Henoko. Base-related referendums in Okinawa have been held before. In 1996, a prefectural referendum on reviewing the Japan-U.S. Status of Forces Agreement with the intent of giving Okinawa more authority over incidents involving U.S. forces took place. Voter turnout was about 60 percent, with nearly 90 percent voting in favor of a review. While the U.S. and Japan have made voluntary adjustments to the agreement since 1996, it has not been formally amended since going into force in 1960. In August 2018, the National Governors’ Association, which includes all 47 prefectural governors, called on the central government to fully revise the agreement.